Today is posting day for the Secret Recipe Club. Each month members are “assigned” a participating food blogger. We choose any recipe from the assigned blog to make or bake, and blog about the recipe keeping the blogger a secret until posting day. My secret blogger this month is Dana, Food for Thought. I knew Dana’s Chicken Empanadas with Ranchero Ranch Dressing recipe would be a hit with my family. They especially liked the easy spiced up ranch dressing. Dana used a ravioli press to shape her pretty empanadas, but I didn’t have much luck using it. Instead I just folded the edge over and sealed it together with the tines of a fork. Then I flipped them over and crimped them again with the fork – this side looked much prettier. I substituted Pressure Cooker Chicken Taco Filling for the filling, but you should stop by Dana’s and check out her Lime Chicken filling with goat cheese, which I’m sure would be delicious. These are best served the day they’re made. So just bake as many as you think you’ll eat, and freeze the others for another day. I was able to make 18 empanadas by re-rolling the scraps. To make the dough: In a bowl, combine flour, baking powder, and salt. Using your fingers, cut in butter until mixture is crumbly. Add just enough cold water so dough comes together. Turn out dough onto a lightly floured work surface, and divide in half. Knead each half 2 or 3 times to form smooth balls. Cover dough balls with plastic; let stand until slightly risen, 20 minutes. Roll out half of the empanada dough very thinly, 1/4? thick or less. Cut 4 to 5 inch circles of dough. Place about 2 teaspoons of the chicken mixture inside each circle of dough. 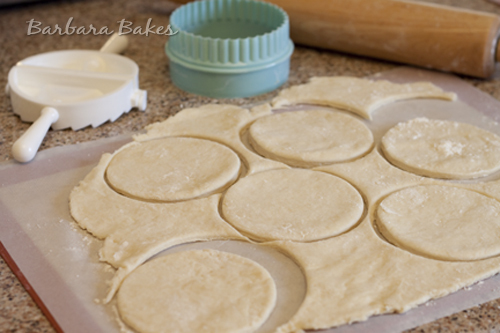 Fold the dough in half over the filling, making a half moon shape, and pinch the edges together to seal in the filling. Fold curved edges under and crimp decoratively. Repeat with the rest of the filling and dough (you may end up with extra dough or extra filling–it seems to work out differently each time). If freezing for later use, freeze on a baking sheet until firm, 2 hours. Wrap tightly in plastic; freeze in plastic bags. To bake fresh or frozen empanadas, preheat oven to 400 degrees. Place on parchment-lined baking sheets. Brush tops with egg wash, avoiding crimped edges. Bake until golden brown, rotating sheets halfway through, 25 to 35 minutes. 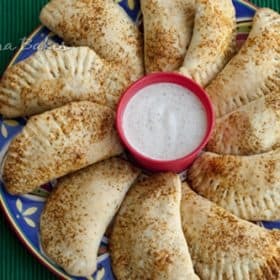 While empanadas are baking, make dressing by Combining ranch dressing chile powder and cumin in a small bowl. Whisk well. Let sit for at least 10 minutes for full flavor. 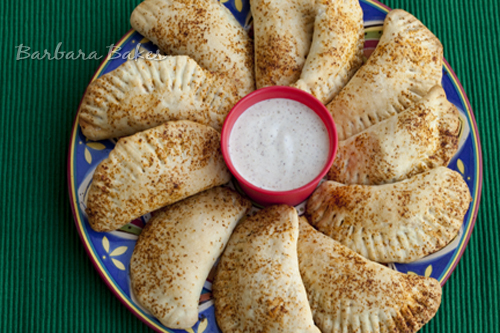 Serve empanadas warm or at room temperature, with ranchero ranch dressing for dipping.